Local school trustee elections allow the community an important opportunity to lead and oversee our valuable investment in public education. Trustees are hardworking community leaders who come together in the context of a board in support of student success. The work is demanding, but important and rewarding. A trustee’s role is to maintain a focus on student achievement and well-being, and to participate in making decisions that benefit the entire district while representing the interests of their community. The Board of Education of School District No. 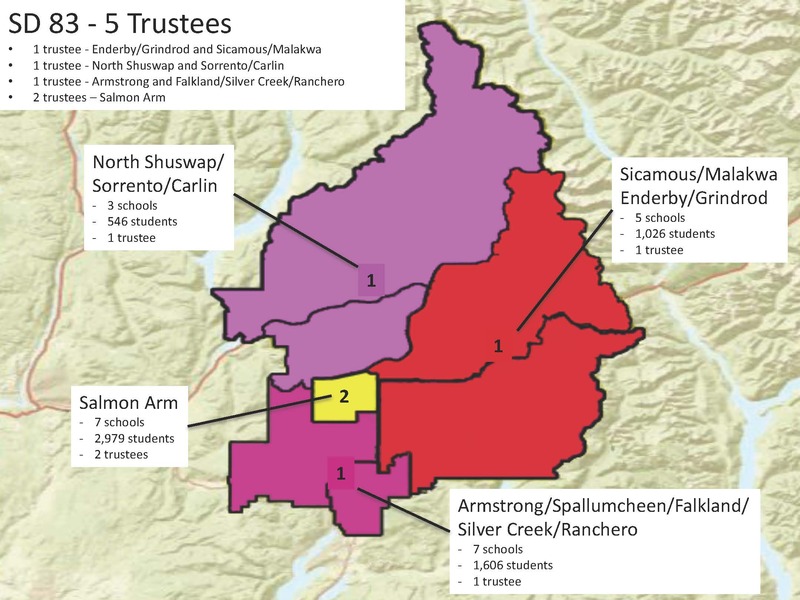 83 (North Okanagan-Shuswap) will now be comprised of five trustees, as per Ministerial Order given by the Minister of Education in February 2018. Please click here to view our Trustee Electoral Area map. A Trustee Candidate Information Session was held on May 7th at the District Education Support Centre. The complete presentation from this session can be viewed here. A repeat session is planned for June 19 at the District Education Support Centre.